The weather here in Wales has been glorious which has meant I have spent a lot of time in the garden, but this afternoon I have taken time out to make my next F&F Challenge creation for the #117 Summer Challenge. 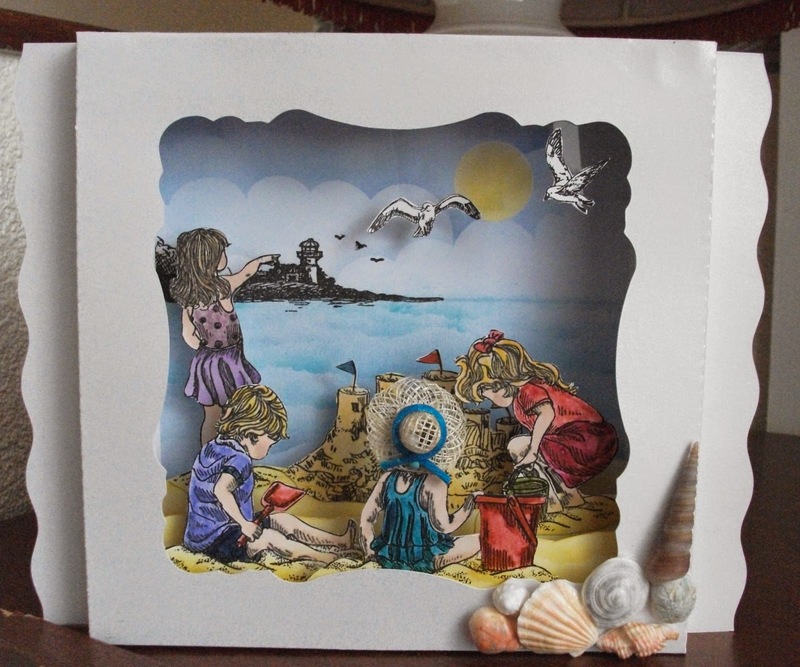 I saw these Creative Expressions stamps and they reminded me of Nostalgic Summers long ago spent on the beach making sandcastles and paddling in the sea..... that sums up Summer for me. I cut my shadow box on my silhouette machine and then used the Creative expressions stamps to make the characters. I made the backdrop of the horizon,sky & sea with adirondak inks. I added the children on strips of card which were then inserted into the concertina folds, I used distress markers and promarkers to colour them. The little girl sitting in the front is wearing a tiny straw bonnet which came free with the stamps. To finish off I added some shells which I made from Martha Stewart paper clay in a silicone mould, this clay is unbelievably light in weight which is ideal if you're posting cards. Hope you will enter our new Summer Challenge which is being sponsored by Crafty Sentiments and hosted by our very talented designer, Vanessa, it's so easy to do, just upload your entry using the link on here or there are details of how to send via email on there too. Holy smokes Annie this is such a FABULOUS scene!!! I feel like I am actually looking out to sea along a beautiful coastline!! PERFECTLY coloured and the addition of the little straw hat is just so cute!!! MARVELOUS Annie!!!! Truly Top Notch....LOVE IT!!!!! GASP! ANNIE!! I absolutely love this gorgeous shadow box!! You are so talented! What a special treat it was to post this wonderful project for our, "Summertime" challenge! 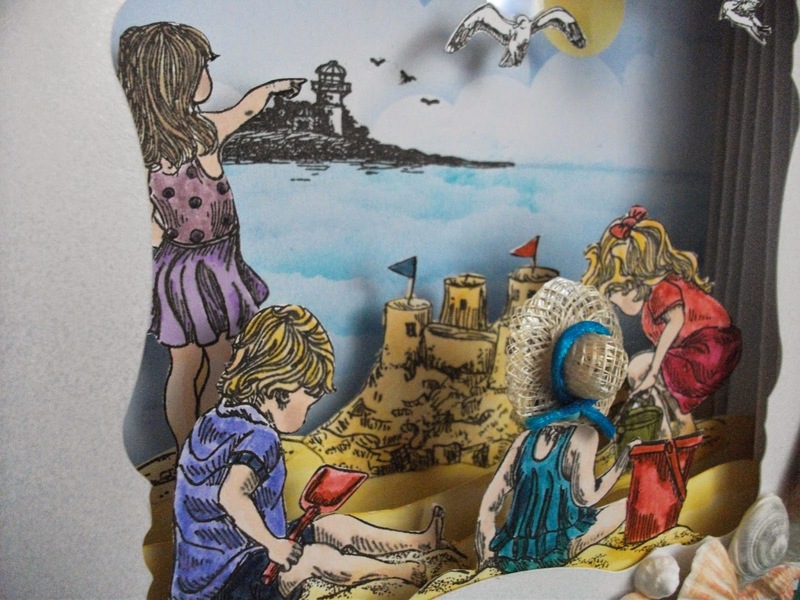 Your colouring is beautiful and the straw hat is adorable! I am so very impressed that you actually made your own sea shells! Admiring this beautiful summertime project and reading your post made my heart smile!